Quik-Stand is the easiest and most inexpensive way to secure your targets down range in just about any outdoor terrain. The ultra durable corosplast backer remains sturdy even after hundreds of rounds have passed through. No other target stand gives you the setup ease, durability and value. 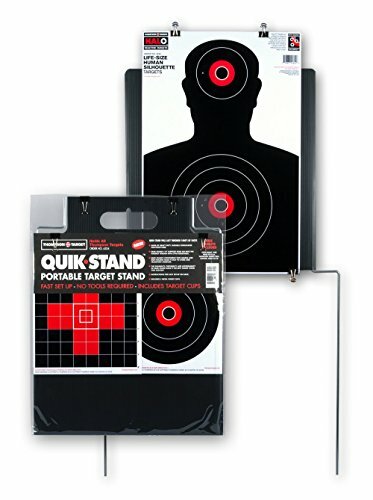 Quik-Stand includes a sturdy polypropelene plastic target backer, steel support rods, 4 metal target clips, and free targets! Instructions: Simply pull out steel supports and thread them into the the bottom of the backer on either side using the coroplast fluting. Then, place the stand down range by driving the steel rods into the ground using downward force on both rods at the bends. Clip your targets to the backer and you're ready to shoot! If you have any questions about this product by Thompson Target, contact us by completing and submitting the form below. If you are looking for a specif part number, please include it with your message.